It's never too early to take care of your child's teeth. Using natural remedies only aids in the process. 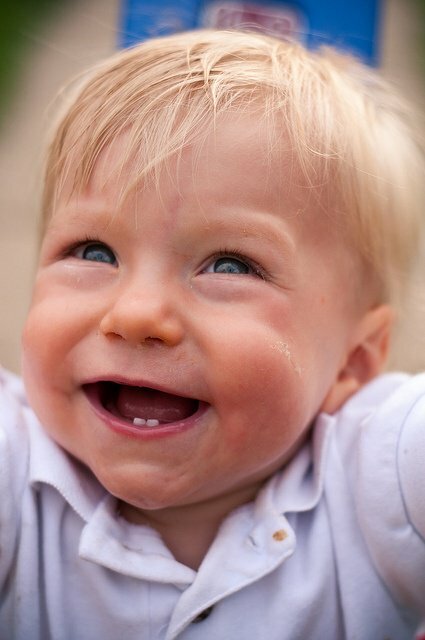 As soon as your child gets teeth, it is necessary to take care of them. Here are some helpful ways to make sure your son or daughter keeps pearly whites for life. Naturally, food plays a major role in the health of the teeth and gums. Refrain from giving your child foods that are high in sugars and starches. Or, if you do give your child sugary foods (like fruits and juices) make sure that they (or you) brush their teeth thoroughly. As with anyone, sugar on the teeth contributes to the development of tartar and plaque, which causes cavities. Tooth decay in children is nothing to ignore; even though their teeth fall out, they need to develop the healthy habits for life and do it early. Use healthy whole grains in your child's diet; that will give them the nutrition they need while also keeping their teeth healthy. Virgin coconut oil, noni enzymes, and xylitol are all natural products that can help keep your child's teeth healthy and strong. In fact, Biconi Products makes a toothpaste for children that uses all of these ingredients. Keeping your child from harsh chemicals is especially important in the first years of life. Natural toothpaste that is free from chemicals means that your child gets the opportunity to have healthy teeth and gums that aren't coated in fluoride. Plus, natural toothpastes are free from parabens, sulphates, alcohol, mineral oil, and several other elements that aren't the best for little ones. It's important to brush your child's teeth and teach him or her the proper method. This ensures that your child is getting all surfaces cleaned properly. Once your child becomes older, then your child should be able to follow the guidelines and put those techniques into practice on a routine basis early on in life. Make sure that whatever you do for your child's teeth is something that both you and the child can keep up with. Don't get too aggressive; just remember to instill healthy habits that will last a lifetime so that when the adult teeth come in, they stay with your child for life. Be sure to floss your child's teeth as well. After all, without flossing, you miss a large portion of the tooth that is below the gum line. Make the tooth-cleaning ritual fun so that your child knows that it is something he or she can enjoy throughout life.